In Toronto, I have a Rocky Mountaineer hybrid bicycle. It’s light and fast, yet practical enough to use for most day to day trips. But it is too valuable to leave sitting around a university campus. Theft-proof: It should be unattractive to thieves, given the high theft rate around the university. Practical: As my only vehicle, it needs to be able to ride in any weather and have a large cargo capacity. It should also be reliable. Efficient: I don’t want to be sweaty when I get to my destination. 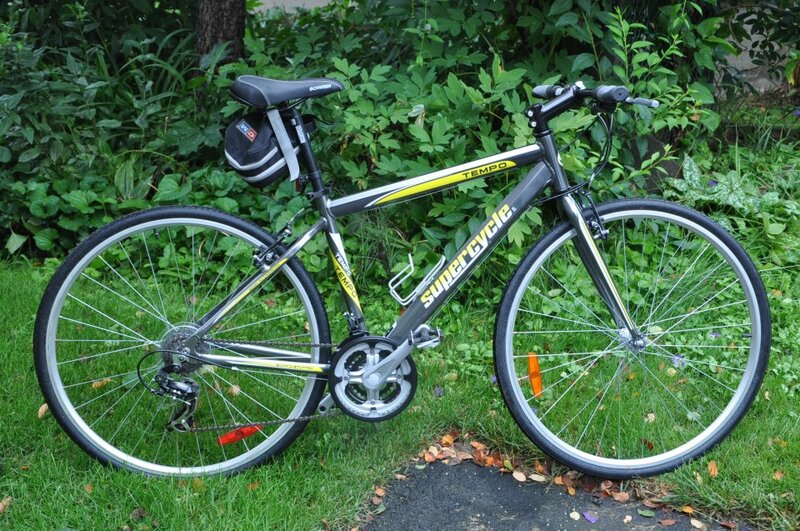 I ended up buying a SuperCycle road bike from Canadian Tire for $150. I mainly liked its lightweight aluminium frame and its low cost. From the factory, the bike did not meet a single one of my criteria. 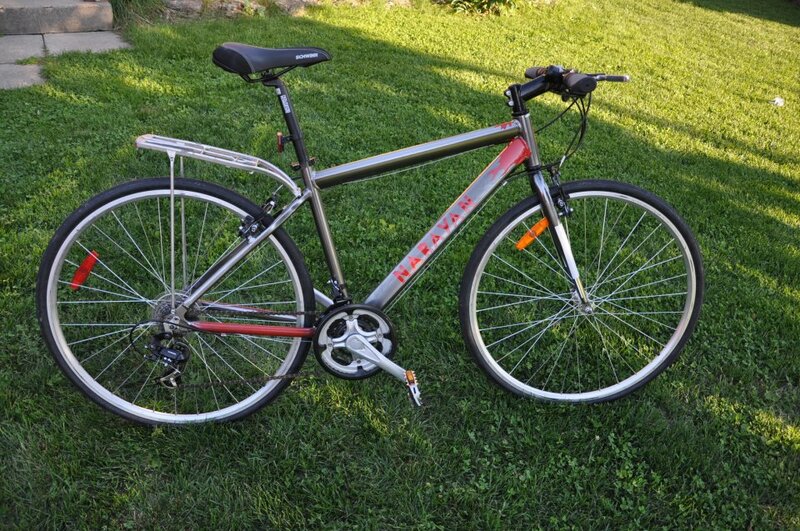 As the cheapest road bike at Canadian Tire, it is extremely common so it would be hard to trace if it were stolen. It had no carrying capacity. And its components were rubbish, so no amount of adjustment could get the gears to run smoothly. 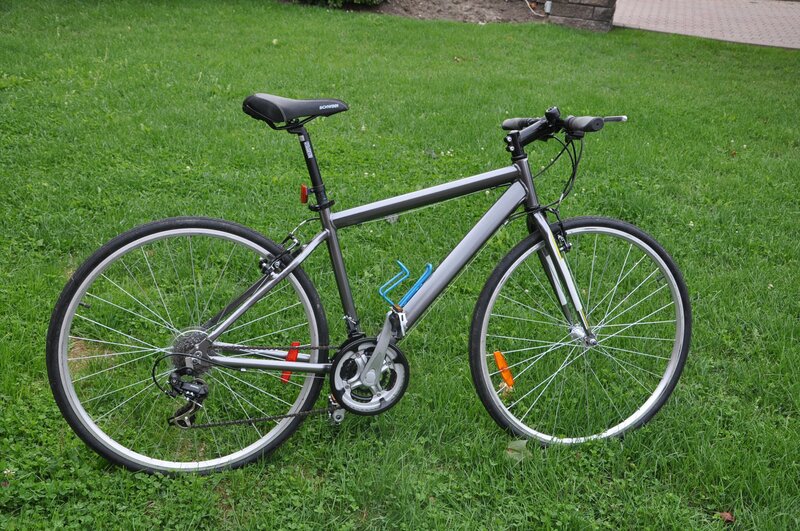 I then embarked on my transformation of a crappy bike to a somewhat useful one. I decided to repaint the bicycle to make it unique and traceable. I was aiming for something with little taste – I didn’t want to increase the value. wrapped the tubes in painter’s tape, cut out my designs with a box cutter, and painted with some leftover automotive rust paint. Et voilà! A less nondescript SuperCycle! To improve its practicality, I was fortunate to have access to free parts left over from my father’s time as a bicycle racer. I found a rack, saddlebags and fenders to put on the bike. I also swapped the awful SuperCycle seat for one off my Schwinn mountain bike. The bottom bracket wore out after a few months of riding, and on the advice of a mechanic, I replaced the entire unit with a better one rather than merely replacing the bearings. It was definitely the right thing to do – I have not had any issues since. I also got fed up with the grinding gears, so I took off the gear mechanism (and kickstand while I was at it). 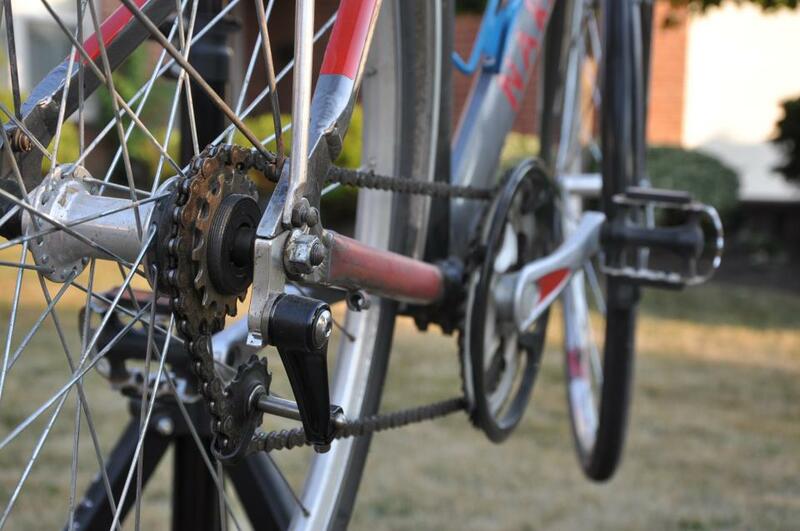 I made a single-speed rear hub from parts in my garage, and bought a chain tensioner. The modification got the bike running smoothly and lightened it by over a kilogram! Now that I’ve dealt with the main issues, I’m fairly pleased with my bicycle. I really like the fact that I can travel more quickly and with less effort than most other students, who have heavy mountain bikes. That said, if I had the opportunity to do it over, I would not buy a new SuperCycle. I expect that I would have had a better experience if I had bought a used bike for the same price. ultimate bike! if it can survive a year at a canadian university it can make it anywhere! A really interesting post. I have to say, I read through the whole article with a comment in mind, Narayan, but then you beat me to it with your last two sentences. I hope someone has introduced you to Recycle Cycles by now? It should help make future adjustments and improvements a snap. Still, you didn’t mention the most important aspect of bike security – even a personalized Supercycle deserves a good lock! Good luck with the bike this winter. Thanks for sharing this, Narayan. Always interesting to see people’s ingenuity in building or refining a bike. Bike thieves will steal any bike, it doesn’t matter if it’s rusty or not… if I were locking at the university I’d be using a heavy duty security chain (mec sells the chain but it no longer comes with a tiny u-lock). The way to use the chain is to put as many links over the shackle of the u-lock so that thieves can’t pry or jack it open. The big u-locks are a joke, as are all but the heaviest cable locks, they need to be 1″ cable or bigger but a portable grinder will slice through them fast too… I don’t steal bikes but I know how to break locks and steel and the security chain can stand up to an angle grinder for a minute or two, much longer than any u-lock I’ve taken a grinder to. The chain is heavy as sin but at a crowded place it’ll encourage thieves to pick an easier target. Also looks like the bike is a bit small and the seatpost might be too far out, I can’t make out a line but most posts have a line marking the minimum insertion point… with too much post sticking out it’ll either bend the post or it’ll ruin the frame. I admit, “Theft-Proof” may be quite an unattained goal, but I do believe that i’ve made it a bit less likely to be stolen. If someone wants to steal my bike, they will have no issue doing so, but my thinking is that they will choose one of the thousands of other bicycles on-campus to steal first. Any of those other bikes would be nearly impossible to trace. As i purchased it, mine would have been too. In the past year, both my girlfriend’s and my neighbour’s bikes have been stolen, and both were poor-quality mountain bikes. 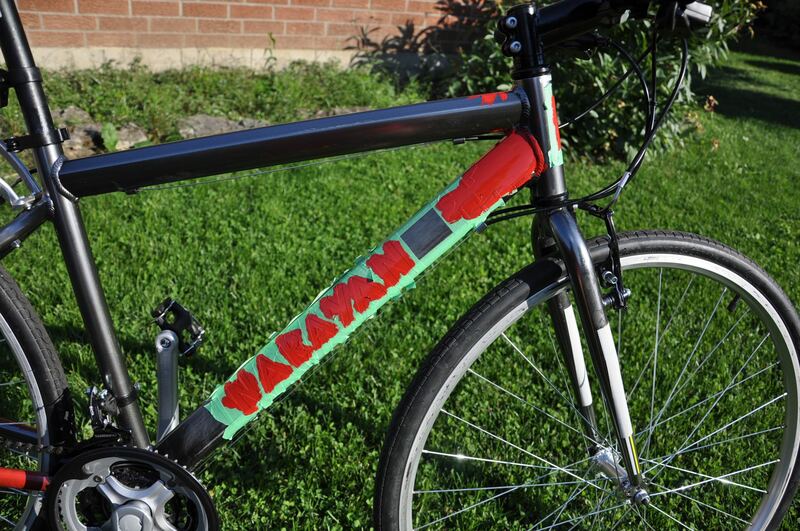 As for help with modifications, I use the University of Waterloo Bike Shop. It costs students $1/h for use of their facilities and tools, and the volunteers are consistently helpful. As an side note, I once encountered someone else there with a Supercycle Tempo who also had a failed bottom bracket. I gather it’s a common problem. Just wanted to clarify – the UW Bike Centre is open to all in the community. Hours are typically 11am-7pm Tue-Thurs, but this varies term-to-term depending on volunteer availability. Adam thanks for sharing, I had no idea the UW Bike Center was open to the community. I’ll have to check it out and soon as my nexus 8 hub is giving me problems.